I am not a morning person by an means. Until the my morning coffee takes over I’m a hot mess. It would help if I wasn’t such a night owl! For this reason I am always looking for easy breakfast foods to fix that don’t take a lot of time to make. 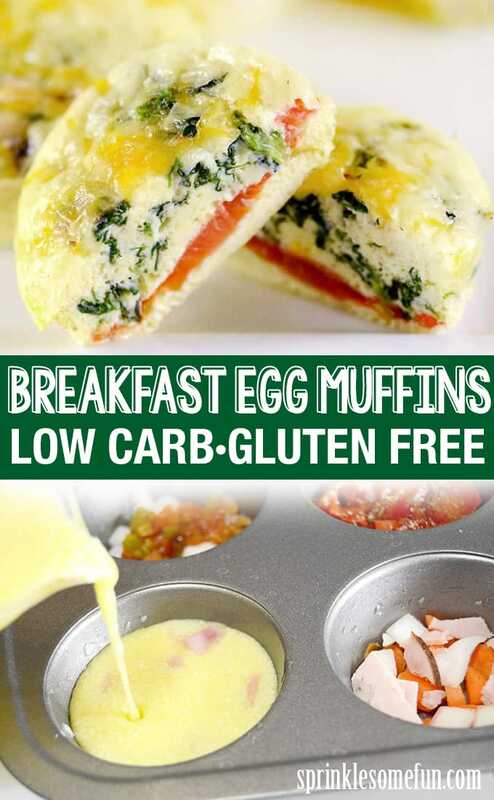 These Easy Make Ahead Breakfast Egg Muffins are gluten free, low carb and low calorie! These are simple to make ahead of time and have them handy for a quick breakfast or snack. This post for Breakfast Egg Muffins was created as part of a relationship in which I was sponsored by Weight Watchers. I do not usually eat breakfast in the mornings and I hear I am not the only one like this. If you also struggle to get that important first meal in then you are in good company with me. I wanted to start trying to eat breakfast more regularly and that’s where these Breakfast Egg Muffins have come in handy. 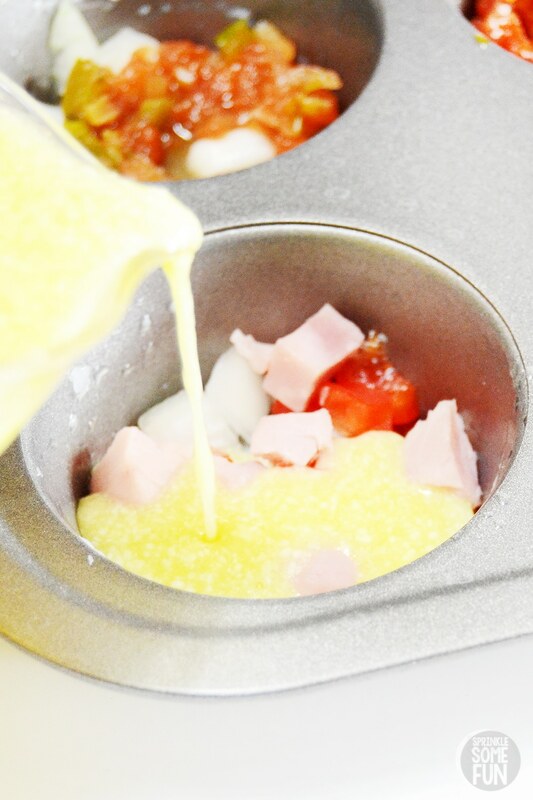 Breakfast Egg Muffins are quick and easy when made ahead because they are reheated in the microwave for 1 minute. I guess I don’t have much excuse not to eat breakfast now? lol Not to mention they taste great! They are almost like a little cheese quiche in an easy to hold form. This recipe makes enough for 1-2 weeks for one person depending on how many are eaten in a day. Freeze up to 2 months or refrigerate for up to 3 days if you want to make them ahead of time. Add a variety of ingredients. Put different ingredients into each cavity to make up to 12 different flavor combos! 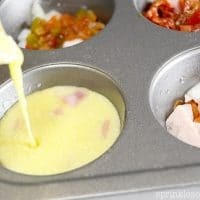 Think of anything that tastes great in an omelet and it would be great to use in these Breakfast Egg Muffins. I suggest leaving the egg base as is, though. Also… different ingredients will have a different calorie count so keep that in mind. 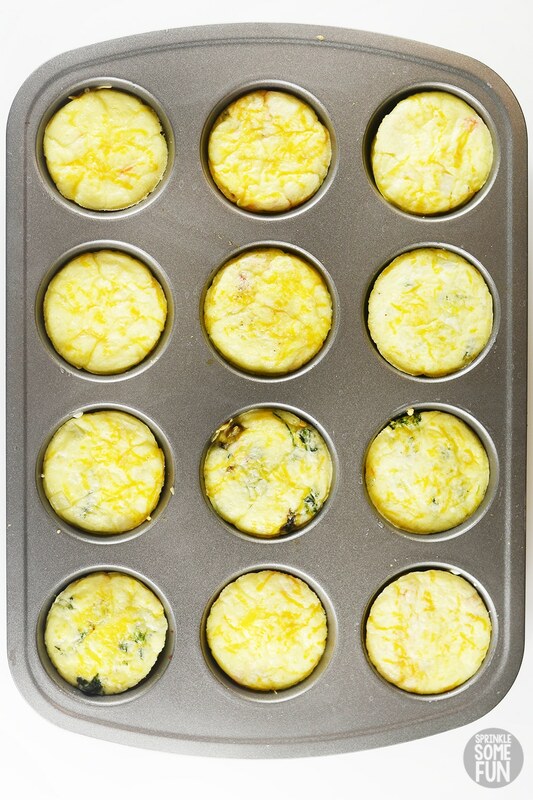 Use different shaped muffin pans. Do you have a heart shaped muffin pan you haven’t used since forever? Or maybe that duck shaped muffin pan since that baby shower you planned years ago? Well these would be fun to make in any muffin pan… even silicone will work. If you want them to be the same calorie count then make sure to use one with only 12 cavities. Switch it up with egg substitute. Egg beaters works great with this recipe and brings down the calorie count a bit too. Try different cheeses. Try something new every once in a while. A little smoked gouda or swiss would be good in these. Be careful not to overfill the cups. Be careful when filling these up because the egg mixture will be easy to spill when you put the pan in the oven. This is why the recipe is written for only 2/3 full. Like a creamier taste and don’t mind the extra calories? Add in milk or cream to the base and more cheese! How long can you keep egg muffins in the refrigerator? Up to one week is the optimal time to keep them in the refrigerator. After that transfer them to the freezer. The reheating time does not change by much this way and they still taste great. 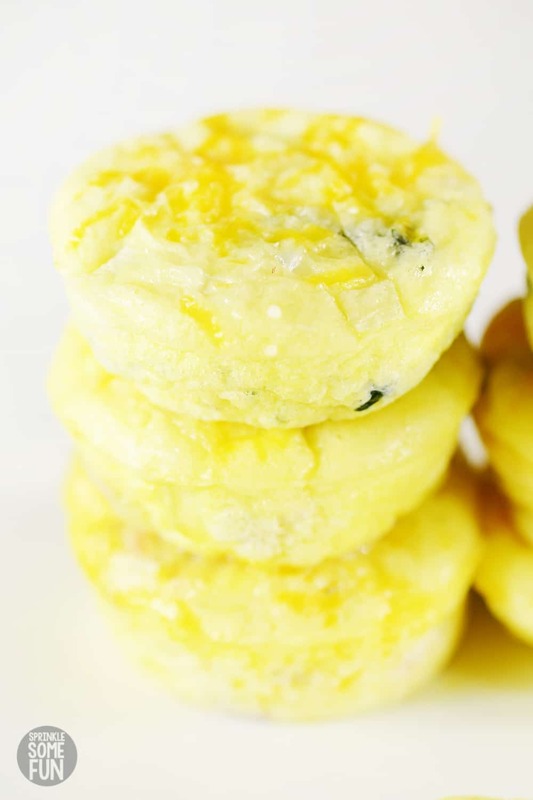 How can you keep egg muffins in the freezer? These should last around 2 months if wrapped tightly in a strong plastic wrap and sealed in a zipped up bag or air tight container. After that they are prone to freezer burn. How should I store Breakfast Egg Muffins? Keep them tightly covered with plastic wrap first and then in an air tight container or zipped up plastic bag. How many calories per egg muffin are these? Around 90 calories each. I can’t tell you exactly because the ingredients are up to you, but they are each around 90 calories with the just the base (eggs and cheese). What do Breakfast Egg Muffins taste like? I think these taste like a cross between an omelet and a quiche. If you want them to be more “quiche” like then add more parmesan cheese or even a little flour to the mixture. How do you reheat egg muffins? Just put them in the microwave for around 15 seconds. Check them after 15 seconds and they may still need a little time. If using them straight from the freezer you’ll need extra time. Just repeat the 15 seconds until they are cooked through. You can leave the plastic wrap on them for easier reheating or place them in a covered microwave safe dish. These Breakfast Egg Muffins are one of the most popular recipes on Sprinkle Some Fun and for good reason. 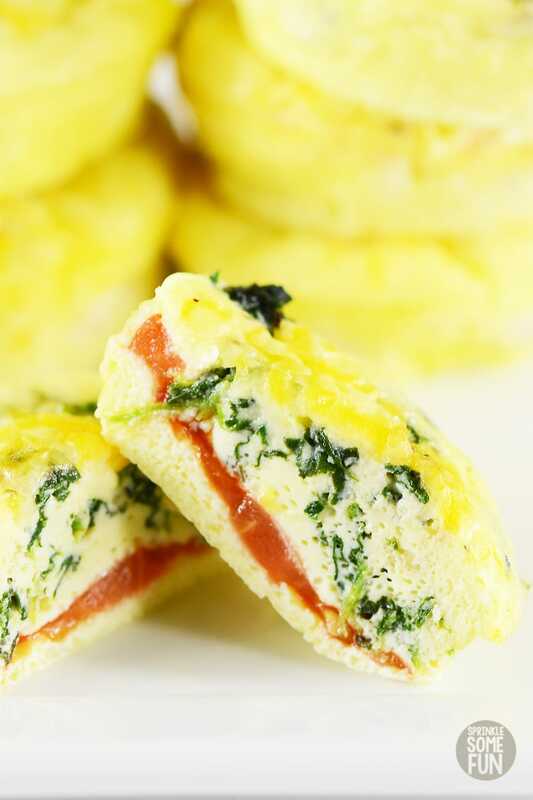 Breakfast Egg Muffins are great for most healthy eating plans and can easily be made to fit into a busy schedule. These are great for the kids also. Have the kids pick their own ingredients to add in. My kids love the ham and veggies in theirs. 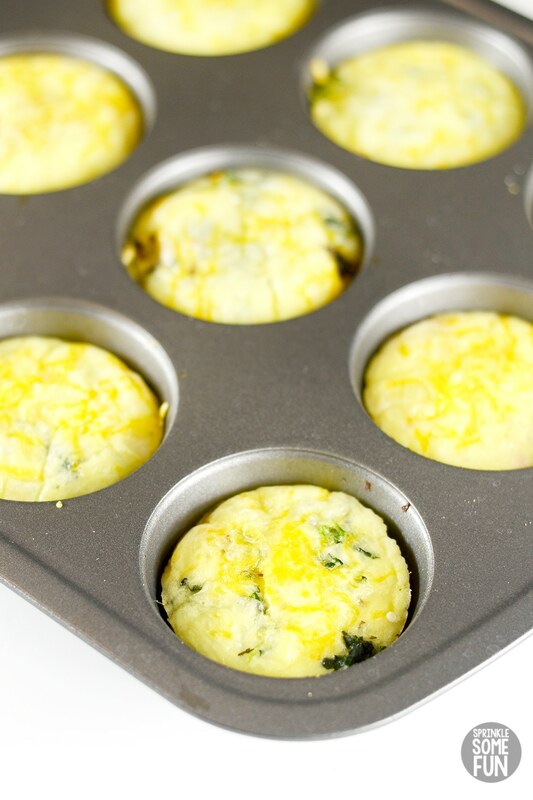 Love this recipe for Make Ahead Breakfast Egg Muffins? Check out this recipe for homemade Instant Strawberry Oatmeal Packets with added protein. These are also easy to make in the mornings with just a quick two minutes cooking time in the microwave. We like to change up the fruits in them with any dried or freeze dried fruits! With the Make Ahead Breakfast Muffins and the Instant Strawberry Oatmeal Packets we have a variety of healthy breakfast ideas to choose from. Since they are both made in just a few minutes it makes mornings a little easier this way! I hope you enjoy this recipe as much as we do. Easy Make Ahead Breakfast Egg Muffins are simple to make ahead of time and have them handy for a quick breakfast or snack. Lightly grease a muffin tin with cooking spray or your choice of oil. Put 1 to 2 Tbsp. of your choice in fillings (see my suggestions above) into each muffin cavity. 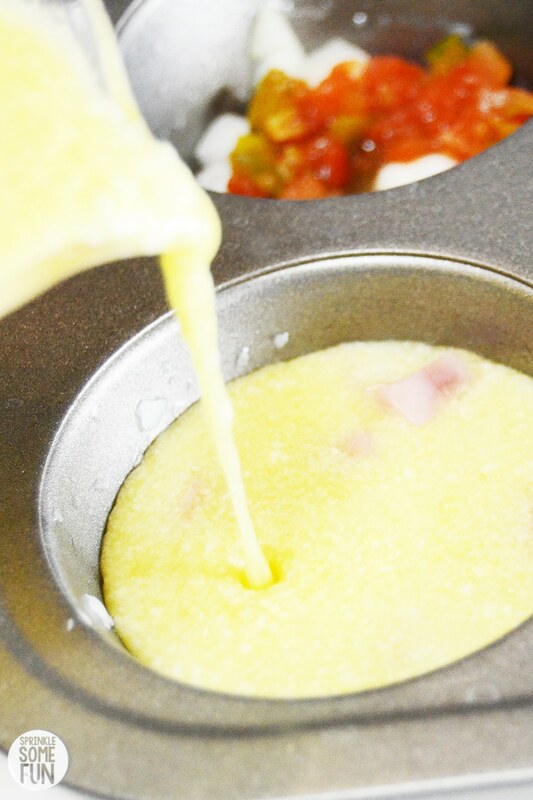 Beat together eggs, egg whites and parmesan cheese. Pour the Egg Base into the muffin cavities until they are 2/3 of the way full then sprinkle a small amount of the cheddar cheese onto the top of each egg muffin. Bake at 350 for around 20 minutes or until the centers are baked through. Serve immediately or wrap each egg muffin in plastic wrap and store in the freezer until ready to use. Heat up in the microwave on high covered with a paper towel for around 1 minute (microwave ovens vary so yours may need more or less time). This is a great idea and will work perfectly for the eating plan I’m on! Thank you! Thanks, Sarah! I hope you enjoy these as much as I do! They are SOOO easy! I do a version of this with a mini muffin pan and multi-grain pancake mix with blueberries, strawberries, apples etc great little snacks on the go as well. 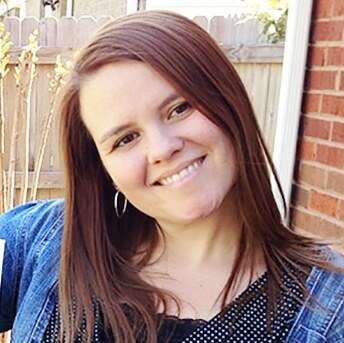 Hi Rachel, these look great and I can’t believe they are only 3 WWP+. 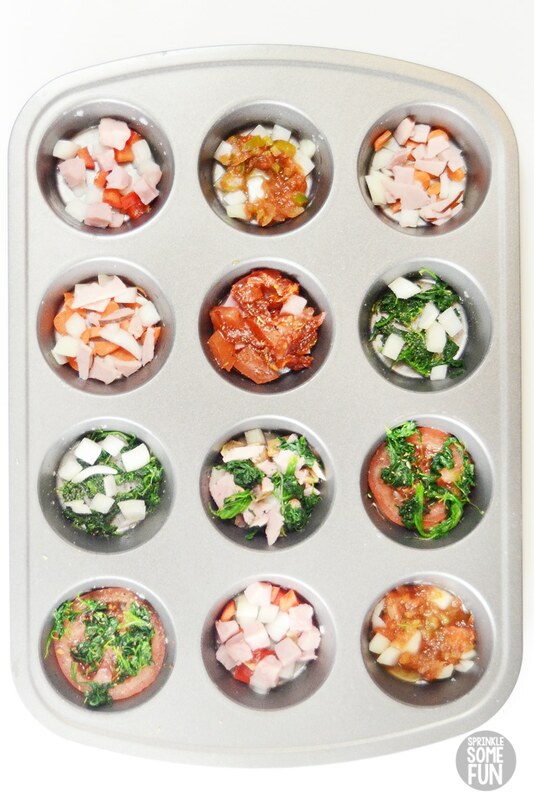 Can you clarify if you used a mini or regular muffin tin? It’s a regular sized muffin tin which has 12 cavities. Hope that helps. These are awesome made ahead of time…..we made 100 mini quiches (egg with medium salsa and shredded cheddar cheese for Christmas morning breakfast served with ham and hashbrown casserole…loved by all! Froze remaining quiches for homeless people in need of a quick meal. I would like to try spinach; tomato and feta cheese…MY FAVOURITE OMELETTE made into quiche! Now, this is something that might work for me. thanks Rachel and Weight Watcher’s. I just made these and they are yummy. How did you enter them in the Point Plus Calculator for tracking purposes? LOVE THESE! They are so easy and so good! Do you know about how many Calories are in each muffin? I count calories and am not on weight watchers so i don’t know what 3wwp equals. So easy to stay on track with the muffin eggs made ahead. Delicious too! This is such a wonderful an delicious idea, I think I’ll do these once a week!!!!!!! How long can you keep these in the fridge for? I do not like eggs but i do like quiche. Do these have an eggy taste or is it more of a quiche taste. If it taste like say an omelet i won’t like them. These are more like an omelet. if you want them to be more like a quiche you will need to add in some flour.